Symptoms such as weakness, feeling tired, shaking, sweating, headache, hunger, nervousness and irritability are signs that a person's blood sugar is getting dangerously low. 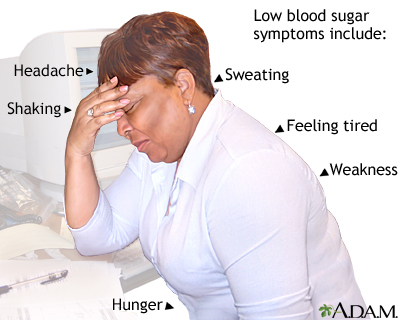 A person showing any of these symptoms should check their blood sugar. If the level is low (70 mg/dL), a sugar-containing food should be eaten right away.